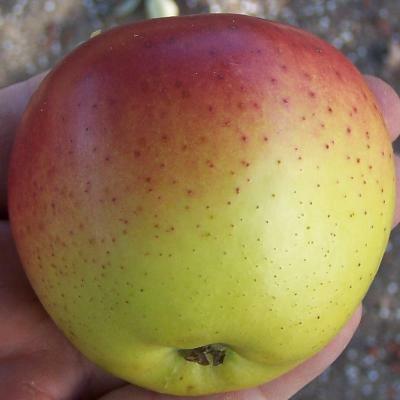 This is Putty Henck apple, named after J. Putnam Henck who was known by those who loved him as “Putty”. He was a fixture in the San Bernardino Mountains since the 1920’s, most known as the man who built and later ran Santa’s Village amusement park. He also built many commercial buildings in Riverside, along with Highland Elementary School. 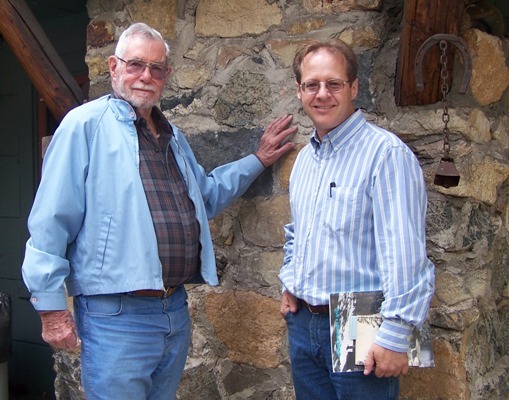 In 2006 he found out that my wife and I were looking for old apple trees and varieties in the mountains, and graciously loaded us up in the back of his Jeep for a tour. He was in his mid-80s by then and could barely walk, but still drove like a bootlegger down the windy, foggy mountain roads he’d been driving his whole life. He introduced us to a lot of people and took us all over to see apple trees from the 1890’s, but the most interesting tree we found was one right in his back yard. It was a volunteer seedling that came up next to the 1924 cider press some time in the 1970’s, visible in the photo above to the left of the press. That’s his son Dave feeding the shredder powered by an old hit-miss motor turning a wide leather belt. 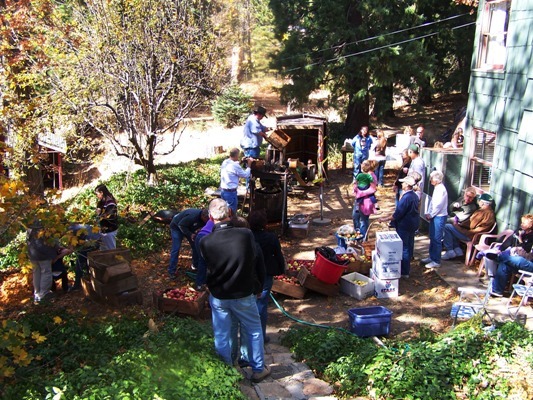 This was the last community cider pressing and potluck Putty would have at his house. I’m glad we were able to do this and meet his two sons, Pete and Dave, along with a good sampling of the Skyforest community. I understand this used to be an annual event, but sort of petered out as Putty aged. It was nice to see it revive one more time, and everyone had a wonderful time, including Putty. The food was really good and we made a ton of cider. Putty told us the tree was a seedling and gave good apples, so I took some cuttings and grafted them down here in Riverside. It ripened the middle of November up in the mountains, and even later down here. 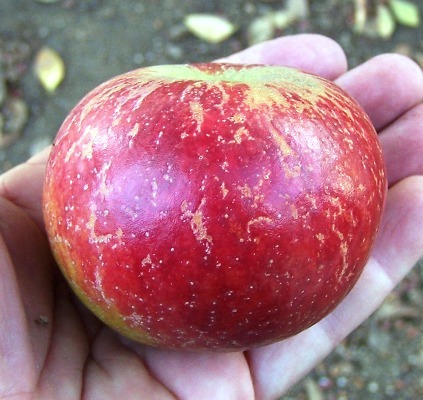 It remained crisp, juicy, and very sweet/tart and improved in storage, and is excellent when grown in our climate. I decided to make it a named variety in our nursery, and as is proper protocol dictated by the American Pomological Society, I asked Putty for permission to name it “Putty Henck”. He graciously agreed, and one of the first places I planted a grafted tree was Highland Elementary for their 50th anniversary, to which Putty video taped a greeting that I also gave to them. Putty passed on early this year, and will be sorely missed. I’ll be planting one of the trees at the Rim of the World Historical Society’s new museum in Lake Arrowhead, so every one else will be able to taste a legacy of Putty Henck. We’ve been keeping an eye on this variety for the last few years, as it consistantly bears excellent crops of late, dense, sugary/tart apples that blush to a deep dusty rose red. Despite our lack of chill it has a very compact bloom period, and despite bearing heavily it still puts on a good couple feet of growth each year, readily bearing lots of scionwood for propagation. 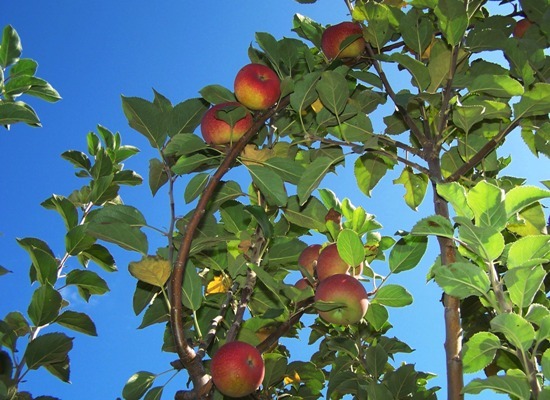 These are attributes we look for when considering an apple for the tropics, as dependable bearing and vigor are important in a tropic climate that is tough on apple trees, as they will soon revert to bearing two crops a year while never going dormant. This was one of the varities we sent to Rwanda a couple years ago, and we’re waiting to see how it does. Either way it is excellent here in Southern California where it ripens around Thanksgiving. Borers had ravished this tree a couple years ago, and I gave it up for dead, replacing its name in my inventory list with one I wanted to plant there. But the tree sprung back, and I had to scramble to see what name it originally was. The red skin and translucent watercore gives it away as Thompkins County King. It hails from New Jersey around 1804, and is renowned for being a regular bearer in adverse conditions. It supposed to ripen in September, but here at Thanksgiving they are just starting to ripen. This is fine with me, as our days are warm and nights are getting cold, excellent apple ripening weather. This one in the photo was very dense, sweet, aromatic, and enough acid to make me need a Tums later on (which doesn’t take much now that I’m in geezerville). There are about a half dozen more left on the tiny tree, and so I’m happy to pronounce it excellent for growing in Southern California. From its origin and background no one would have expected this variety to do well in a hot climate; “experts” would have said it is too high-chill or would me mushy or bland. All of this is wrong of course, and just goes to show there is no substituting actually sticking the tree in the ground and seeing what happens. We were up at Riley’s Farm in Oak Glen last Saturday, and there was still a boat load of apples on the trees. We picked Golden Delicious and Virginia Winesap, and they were both excellent. It is very odd to still be picking the middle of November, but crowds are very light and most places are still open, so if you’ve put it off this year, this would be a great time to head up to Oak Glen for some apple picking. I recommend the chicken pot pie at Rileys in the tavern, the best we’ve ever had. You may have to take dessert home with you, as you’ll be stuffed. 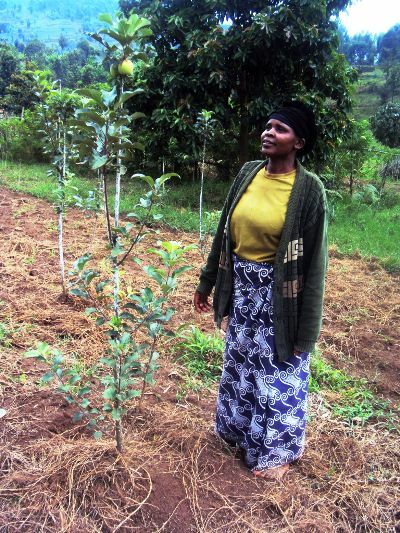 Thank God, the first orchard we sent to Rwanda in February of 2009 bore apples this year. They had about 30 total, but 25 of them were stolen; the local police and military got involved and put a stop to this, and so there are still about 5 apples left. The trees are healthy and obviously like it there, and are already blossoming for the next crop; it appears some of them will bear two crops per year, common in the tropics. 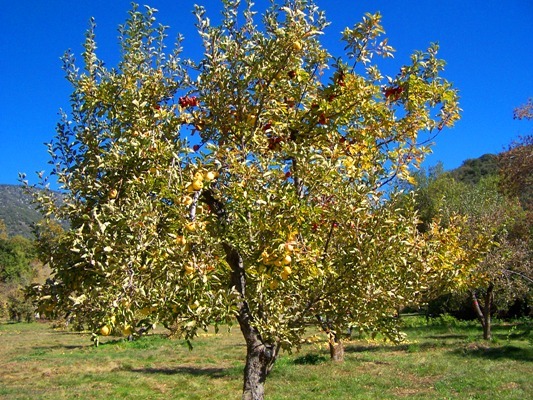 They have done an excellent job of taking care of the orchard, and it will steadily increase in production. 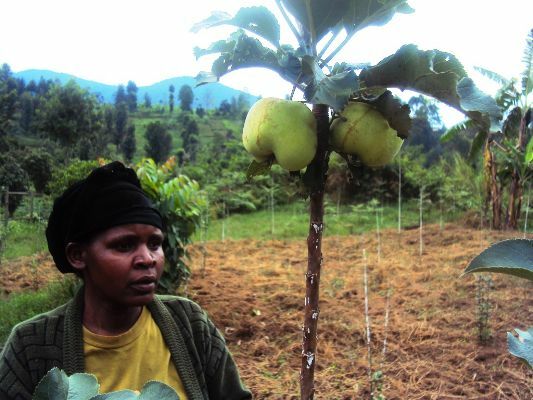 We give God the glory in this for protecting these young trees and providing a way for these women to augment their income, and for giving us such a versatile fruit. I have to admit, this has been a lot of fun to do.